Monastiraki is the place that most of all represent tradition and tourist sightseeing in Athens at the same time. It?s placed under the shadow of Acropolis at the South West section of the magisterial Sacred Rock and next to the Ancient Market and Attalos loft. 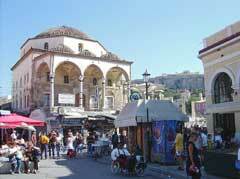 Monastiraki is famous for the flea market and it is a great place for a Sunday morning walk. An early visit in the morning will help as later on the crowd becomes impossible and there are tables available at the many cafes adn restaurants for a drink or a snack.